To help us celebrate Library Week local author Cheryl Koenig is coming to Sutherland Library. Cheryl's life changed forever the day that her 12 year old son Jonathan was involved in an horrific car accident, and suffered a traumatic brain injury. Given very little chance of survival, doctors predicted that he would most likely never walk, talk or eat unaided again. Cheryl refused to accept this prognosis and together with her husband Robert set out on a relentless and ultimately successful quest to save their son. Now, 10 years after the accident, Jonathan has defied the odds and lives a fulfilling life. Join us at Sutherland Library to hear Cheryl talk about this journey in her new book Paper cranes : a mother's story of hope, courage and determination . This book is based around the journal she began whilst staying with her son in hospital. It outlines the search for knowledge in the area of recovery from traumatic brain injury, and describes what enabled them to achieve amazing results. Unleashed Books Miranda will be making available copies of this book for sale and Cheryl would be happy to sign them. Cheryl is also the author of The courage to care and There's always hope..just alter the dreams. In conjunction with Heart Week 2008, Sutherland Library is offering free blood pressure and glucose level testing on Thursday 8 May, between 10am and 6pm. Clinical nurses will be available to answer any questions you may have on the heart and heart disease. Two out of three Australian families are affected by heart disease. During Heart Week 2008, the Heart Foundation is urging parents and carers to get active with their children. Regular physical activity is an important part of a healthy lifestyle. Making physical activity a priority and encouraging good habits in children from an early age is important and can help them to develop the skills they need to continue being active throughout their lives. Good food habits and daily physical activity – if your child has these, they’re well on the way to a healthy life. The Healthy Kids website show you how to do it, with great ways to get your kids moving, shopping tips and meal ideas for parents, resources for teachers, publications and guidelines, school and community-based projects and links to lots of other useful websites. Why not have a look today! What's Under Wraps This Year? Library Week is coming up and as part of our celebrations we are offering you the chance to be the first to see some of our newest acquisitions. It's called What's Under Wraps and we've done it before. For some time the Library has been stockpiling a selection of new purchases. These books will be unwrapped at a library near you between Monday 19th and Saturday 24th May. It's that time of year again. Library and Information Week 2008 is happening from 19-25 May. Sutherland Shire Libraries are holding a range of events to celebrate and to kick things off we are holding our Annual Book Sale. Don't miss out on the bargains. Come along to Sutherland Library from Friday 16 may until Sunday 18 may and choose from a huge range of fiction and non-fiction, children's and adult books. 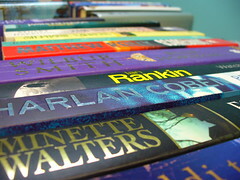 All of our discards over the past year have been assessed with only the best stock selected for the book sale. Along with the many donations from the community there truly will be something for everyone. Everything will be cheap and all book sale proceeds will go towards future library projects so you can afford to buy up big! You might also be interested in our other Library Week events. Are you tracing your family history? Ancestry.com offers a wide and diverse variety of content from around the world to help you to trace your family history. Search thousands of databases and browse original, full-text digital images in census, immigration and military collections. Download helpful census extraction forms, ancestral charts, family group sheets and more. Visit or ring your nearest branch library to make a booking. Bookings are limited to 1 hour however an extension of time may be possible based on availability of computers.